The Amitié Chalets are located on one of Praslin's longest beaches, the appropriately-named Grand Anse. The chalets also lie close to a small village with some excellent restaurants, a few shops, and some small supermarkets. The Amitié Chalets are located on the sparkling beach of Grand Anse on Praslin. Bedrooms with double beds, en suite bathroom, room safe, fans, minibar, air-conditioning, satellite TV, daily cleaning service (linen and towel exchange every 3 days), ironing board and iron available upon request. The Amitié Chalets are run by a very internationally-oriented American-Seychellois couple. They are also related to the owners of the Beach Villas Guesthouse, which is located just a few hundred metres down the beach from the Amitié Chalets. Both properties are similarly-built and feature the typical Seychelles-Guesthouse-Style. They are located on the beach close to each other. The owner and his wife, run the Amitié Chalets in a familial manner, something you'll feel as soon as you arrive, and remember long after your stay. 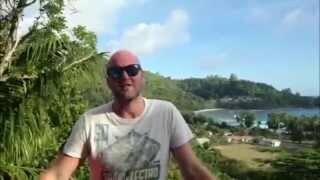 If you have any questions about the Seychelles, or if you want to take a tour or a trip on a boat, just ask! Guests often have a rather hard time saying goodbye after spending a holiday with this helpful and accommodating couple. They are making these chalets a truly wonderful place for a Seychelles holiday on Praslin, offering a great atmosphere and real value-for-money. Each of the chalets is built facing the ocean, with a small private veranda in front. All of them also offer a small private area where you can relax and enjoy the view of the ocean, and just a few steps away is the fine, white sand of Praslin's Grand Anse, making the outdoor surroundings of the chalets a real joy to behold. Please note: Between May and October/November, there may be a build-up of seaweed on Grand Anse, depending on the weather. Although the sparkling surface of the beach does suffer a little because of this, it gives guests a great reason to visit one of Praslin's many other stunning beaches, which can easily be reached by rental car, taxi, or bus. In fact, there's even a rental car company located near to the Amitié Chalets, who offer car rental for around €40/day. Just a few minutes' drive down the road from the chalets is the UNESCO Vallée de Mai nature reserve. This sensational rainforest area is well-worth a visit, and definitely deserving of its world heritage status. Any additional tours or excursions can be outlined by the owners, and you can even plan excursions on an individual basis. You'll quickly come to realise that everyone does their best to make you feel right at home during your stay at the Amitié Chalets. The owners are happy to arrange boat trips for interested guests - full day (approx. 8 hours) or half day (approx. 4 hours). Trolling and seabed fishing tours are also available, with drinks and small snacks served on the boat to keep spirits up. Trips to some of the best snorkelling and diving territories around Praslin, as well as a traditional Creole barbeque on a secluded Seychelles beach are just some of the other tours on offer thanks to the couple. The tours are bookable on-site and subject to availability (fees apply). The apartments of the Amitié Chalets are very neat and clean, having been refurbished in 2010, and fitted with air-conditioning at the same time. They are located by Grand Anse on Praslin, close to the small village called Amitié, making them an ideal location for a self-catering holiday by the sea. While the thatched Bungalow Round accommodates two people comfortably, the slightly bigger Superior Chalet offers space for up to three people. For families or small groups, the Family Suite with bedrooms is the best choice. Other than that, there is no real difference between the units. kingsize double bed, additional bed, bathrooms with shower and WC, kitchen, ceiling fan, air-conditioning, hair dryer, outdoor shower. Fantastic view of the tropical palm garden and the ocean. 1 queensize bed, bathrooms with shower and WC, small kitchenette, ceiling fan, air-conditioning, hair dryer, outdoor shower. 2 bedrooms (one with 2 double beds and one with 1 queensize bed and 1 single bed), bathrooms with shower and WC, kitchen, ceiling fan, air-conditioner, hair dryer, outdoor shower. Babies and Children up to 9 yrs: Free Of Charge. Children up to 13 yrs: 10 €. Children up to 16 yrs: 20 €. Children up to 9 yrs: Free Of Charge. Honeymooners with a marriage certificate (no more than 6 months old) who book at least 3 nights will receive a bottle of sparkling wine, special room decoration, and a small fruit basket. Guests can order dinner on-site from Monday - Friday (to be requested in the morning; fees apply and subject to availability). Dinner is served at the restaurant of Beach Villa Guesthouse. A member of staff will pick them up at around 7pm and can bring them back too. Starter package provided upon arrival containing juice, milk, bread, eggs, jam, butter, instant coffee, sugar and local vanilla tea. Salt, pepper, and oil are provided. Booking for Guesthouse "Amitie Chalets"